"No one but Marcia Emery could have written this book. It gives us the opportunity to be with this gifted intuitive, teacher and researcher. We hear the stories she collected from hundreds of people � some famous � and begin to realize that the intuition they have is the intuition we have. At the same time she gives us a structure and principles that we can use every day. Slowly but surely, with Power Hunch, we can bring a flow of intuitive decision-making into our lives. Then we begin to see greater beauty, even in difficult times. We turn fears into breakthroughs. We develop a higher vision for our lives, know how to take risks, be timely, have generative relationships, and bring balance and peace to our lives. There are many books on intuition but virtually all of them fail to deal with intuition's central contradiction: that it is both potentially powerful and seemingly ephemeral. In this book Dr. Emery serves as a master guide � drawing on her vast experience, powerful courses, extensive interviews, and consulting work-to move us through this contradiction with a practical guide that can make our lives better, more exciting, meaningful, magical, rich, and, simply, more fun." "This book helped me understand a powerful tool, intuition, which I've often ignored. I'm convinced the techniques unveiled here will help me tap into this asset and enhance my problem solving and decision making abilities." 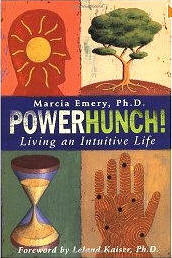 "Drawing on her knowledge as a gifted teacher and therapist Marcia Emery in Power Hunch! teaches you to tap into intuition, the language of the soul. Filled with illuminating and practical exercises you're given tools for a joyous and wise life." "Power Hunch! is not only an excellent reminder that we are always receiving internal and external guidance, but its practical exercises and wonderful stories can help everyone immediately tune up his or her intuition!" "Marcia Emery is one of the world's foremost teachers of intuition. Here she helps us to discover answers from within ourselves to the problems of everyday life. This book is full of both warmth and wisdom. It contains a treasure of intuitive gems." "Powerhunch! is a delightful book. I recommend it to everyone one who has a curiosity about developing their intuitive skills - and that should be every one." "PowerHunch! brings practical wisdom to everyday life. It's a treasury of potent techniques and sensible tips for tapping the mind's hidden resources." "Marcia Emery knows intuition. She knows it from the businessperson�s viewpoint, the healer�s viewpoint, the dreamer and artist�s viewpoint. In PowerHunch! Dr. Emery distills her vast experience with intuitive development into a handbook you can easily understand and really use. Her wonderful generosity of spirit, story-telling ability, and sense of humor make this book a great addition to the important new field of extended perception." "PowerHunch! is an exhilarating invitation for us all to truly trust ourselves! Marcia Emery engagingly illuminates those inner voices and feelings we all have every day and shows us how to recognize and even develop those senses. When you actually follow Dr. Emery's suggestions for trusting your intuition, the world around you changes and you feel more alive! This is a terrific and truly liberating book and a veritable treasure trove of fun and fascination." "Intuition is wisdom from your soul. It's an ever-present guide to help you live your life with joy and passion. PowerHunch! provides you with both practical exercises and down-to-earth philosophy to put you in touch with this valuable resource. Insight and common sense shine through on every page". Lynne Robinson, author of Divine Intuition and Compass of the Soul. "Once again, intuition expert, Marcia Emery, has provided a well researched and easy to read book that gives us the tools, inspiration and trust to follow our hunches everyday in everyway. Read this book and power your intuition into action!" Beginning, intermediate and advanced students of intuition." "Everyone has intuitive experiences. Most don't now what to make of them. Marcia Emery in her latest book, PowerHunch! takes the extraordinary and makes it ordinary by providing hundreds of examples of "normal" people who have had powerful hunches and benefited by listening to them. Read this book and you'll have an easier time integrating your own hunches." "It is time we got past cute intuition trickniques and start living an intuitive life, one that elicits our true, meant-to-be self that is in harmony with the whole. PowerHunch! comes at the right time, intuitively, to give us what we need to enter the flow of a fulfilling intuitive life."